ULP2012-100GPD circle composite membrane. For a variety of household water, hospital, laboratory pure water device and other small systems. 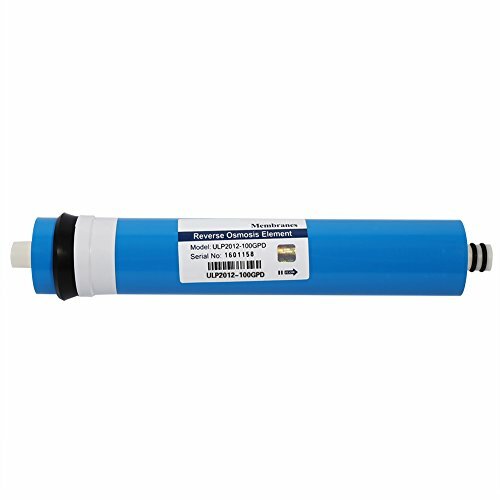 Reverse Osmosis Membrane Elements are extremely reliable alternatives for your residential reverse osmosis systems. Membranes are manufactured in a state-of-the art, ISO-9001-2000 certified automatic rolling facility. Provide a precise and advanced membrane element that delivers an attractive cost-benefit ratio with a membrane that has consistently high quality and performance. ULP series membrane elements applied to salt content of about 2000ppm below surface water, groundwater, tap water and other water desalination treatment. Membranes are manufactured in a state-of-the art, ISO-9001-2000 certified automatic rolling facility. Provide a precise and advanced membrane element that delivers an attractive cost-benefit ratio with a membrane that has consistently high quality and performance. Interchanges with and replaces any standard residential membrane. The membrane at 25 ℃ temperature , the water pressure was under 5.5 kg condition, 1 day (24 hours) produced 100 gallons water (US 1 gallon = 3.785 liters).